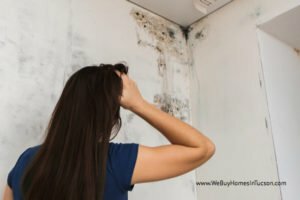 If you have a house in Tucson, AZ that has black mold what are your options in dealing with the mold and can the home be sold? If a house has black mold it should be taken serious. There are serious health consequences for those living in a house with mold. According to the Center for Disease Control and Prevention (CDC) the main illness from exposure to mold are respiratory issues. If you have a home with mold what are your options? Consider vacating the home until the mold is re-mediated. Identify what is causing the mold to grow and fix the cause. Many times it is a leaking pipe that one cannot see be hide a wall. Call your insurance agent to see if they will cover the cost of the mold remediation. Call a local mold remediation expert to take care of the mold properly which can be a big expense and huge project depending on the severity of the mold invested areas. If dealing with the mold issue is too much to handle think of selling the house to someone like us. 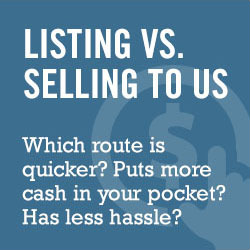 If you would like to discuss the option of selling your home “AS IS” to We Buy Homes In Tucson give us a call at 520-433-9298.